UChicago’s squash team is making waves in its second year of existence. 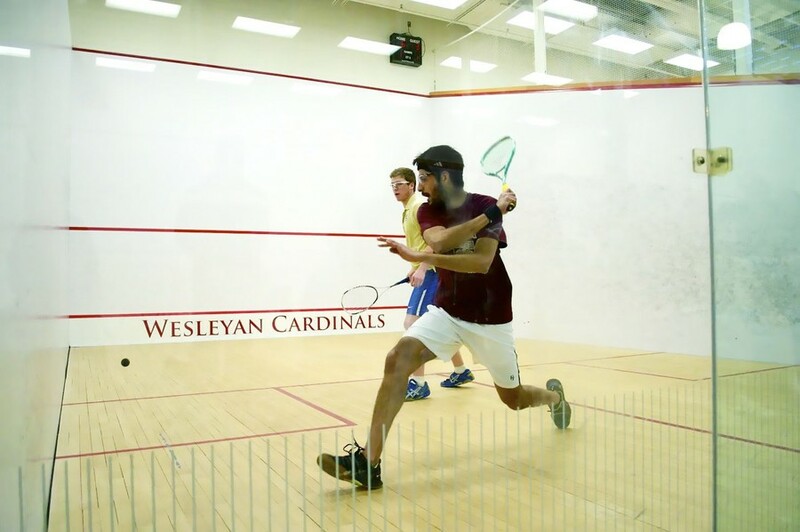 After starting the year ranked 43rd in the country—out of 77 university squash teams—the Maroons finished 32nd this season, better than all but two other club teams and ahead of Midwestern rivals Northwestern and Wash U.
Squash—a racquet sport played within four walls—is famous for being a relatively cerebral sport. After alternating serves, players have to hit their returns above a line on the front wall and return balls before they bounce twice. Everything else—hits off the side and back walls, feints, and spin—is fair game. Teams pit their best nine players against each other in order for best-of-five sets of first-to-eleven; whichever team takes the majority of the individual games wins. Chicago started its season in November, when it dropped only two games in victories over Wash U, USC, and Duke at a tournament hosted by Northwestern. According to Musvee, beating Wash U soundly demonstrated Chicago’s improvement from last year; last year, the Bears beat the Maroons at Nationals. “The Maroons returned seven of [our] nine first-team players from last year, and although [we] lost Ameer Aladeen, the club’s founder, an influx of first-year talent made up for the team’s losses,” Musvee said. The club’s roughly 20 regular members are a mix of former tennis players and students with competitive squash experience. In January, the Maroons proved their wins in November weren’t flukes. At another Northwestern tournament, they beat Vanderbilt, Northwestern, and Wash U a second time, again only dropping two games. To get that practice, they traveled to Baltimore to play Swarthmore, Johns Hopkins, Siena, and Georgetown. The club had previously only left Illinois to play in 2014’s Nationals, and Musvee said that the trip was the highlight of their season; the Maroons swept their four opponents to keep their undefeated season going. That’s not to say the team didn’t take its games seriously. The Baltimore trip was also an opportunity for team bonding. Their flight was cancelled, so most of the club members took a 20-hour train ride back to Chicago. “Our camaraderie is great, even though we’re from different parts of the world,” Musvee said. The club has members from the U.S., India, and an exchange student from the U.K.
“We really get along, and that’s something that helped us against other teams,” Musvee added. The Maroons ended up losing all three of their matches at nationals (to No. 28 MIT, No. 30 Bucknell, and No. 25 Hamilton), but they had already made a name for themselves during the regular season. Compared to varsity teams, Chicago’s club plays less often, usually two to three times per week, and at worse facilities. Henry Crown’s squash courts are slightly smaller than regulation size, according to Musvee. But community non-profit MetroSquash, which provides a mixture of tutoring and squash practice to disadvantaged students from Chicago neighborhoods, is building a facility next year on East 61st Street and South Cottage Grove Avenue. The squash club, which makes a point of volunteering with MetroSquash, is hoping to have access to this new facility. “We’re hoping to build a formal program, attract a coach, and compete as a high-end club team or a varsity team,” Musvee said.